When we started the run though the weather was pretty threatening. Normally I wouldn’t even think about going out in the potential thunderstorm rolling in but out I went. Good news is I’m still alive. The storm definitely hit hard and the girl who also wanted to go long was uncomfortable in the weather which I was fine with and we turned back. We still ended up with a 4 miler which combined with the 3 I did this morning was a good day! It looks like I’m going to be the trailblazer for the long runs which is fine with me. So I ended up having quite a great July. The final mileage total was 117 miles running. I actually think I had more running miles than biking which is cool but needs to change since that’s just not enough time on the bike for anything more than the Olympic distance tris. I was way off my 1,000 mile goal entering July. I’m still a ways off but the chart is trending the right way now. I still have a ways to go though since my total mileage after 7 months is 462 miles. That means I need to average about 108 miles for the rest of the year. The bright side of this is that I’m definitely on track for that after this month. With a marathon on December 2nd, I should maintain this level of training for another month before I really start to kick it up. If anything I’ll be ahead of pace by the end of October. This month was just so much better than any other month but its really a shame that it took me so long to get here. 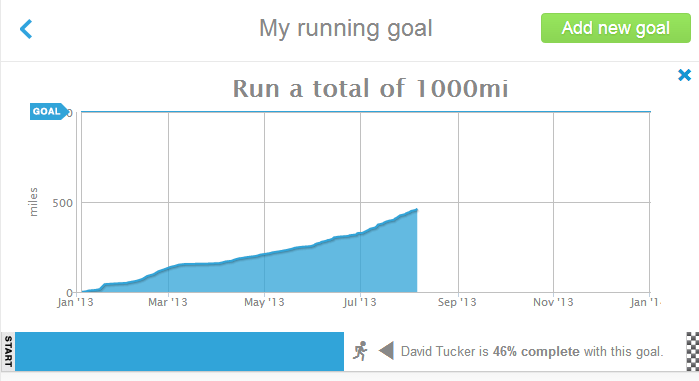 After February I was sure I was on track to hit 100 miles in March and be way ahead of where I am now. I figured I’d be around 600 miles at least. But then I got injured skiing and it really took a whole month to recover. And then several months more to build my miles back up. The crazy thing is that I’m in what I would generally consider my worst months of running. Over the past 5 1/2 years, the summer months are usually when I fall off the horse and then struggle to get back on in late October/early November. Florida summers are truly brutal and the first day of heat you can feel it. This year, for a variety of reasons, I just had extra motivation to keep pushing on through the weather. The next couple months are really a doldrums too for racing. Now that I’m into triathlons, I think I’ll be able to get a race in September which isn’t always easy for me since there’s not as much running it feels like during the summer months. I can’t imagine why! Hopefully next month will bring another good report of me closing that 1,000 mile gap a bit more.